The Pont Notre-Dame is a bridge that crosses the Seine in Paris, France linking the quai de Gesvres on the Rive Droite with the quai de la Corse on the Île de la Cité. The bridge is noted for being the "most ancient" in Paris, in the sense that, while the oldest bridge in Paris that is in its original state is undoubtedly the Pont Neuf, a bridge in some form has existed at the site of the Pont Notre-Dame since antiquity; nonetheless, it has been destroyed and reconstructed numerous times, a fact referred to in the Latin inscription on it to honor its Italian architect, Fra Giovanni Giocondo. The bridge once was lined with approximately sixty houses, the weight of which caused a collapse in 1499. It was on this spot that the first bridge of Paris, called the Grand-Pont, crossed the Seine from antiquity. In 886, during the siege of Paris and the Norman attacks, this structure was destroyed and replaced by a plank bridge, named the Pont des Planches de Milbray (Milbray plank bridge). This bridge was destroyed by the floods of 1406. On May 31, 1412, Charles VI of France ordered the construction of the first version of the bridge to be named "Notre-Dame". This structure was composed of solid wood and connected the Île de la Cité to the rue Saint-Martin. The bridge took seven years to build and had sixty houses atop it, thirty on each side. The houses were noted by Robert Gauguin as being "remarkable for their height, and the uniformity of construction" and was called the "handsomest in France." King Charles' wooden bridge collapsed on October 25, 1499 near 9 a.m., likely due to structural instabilities caused by the lack of repairs. Here's the our members favorite photos of "Bridges near Centre Pompidou District 04". 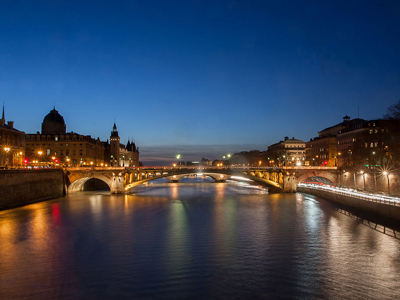 Upload your photo of Pont Notre-Dame!